“Having exhausted all options in and around the Cotswolds for family activities, we looked a little further afield and as I had tried, and failed to use a potters wheel at school, I knew my children (ages 15 & 9) would have fun making a mess – if not an actual pot! 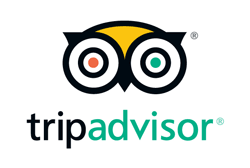 Jon and the team were ready and waiting after booking only a few hours before and we arrived after a very pleasant 50 minute drive from Stow on the Wold. We chose to go with the make, paint and bake option which enables you to throw a pot, glaze it and have it fired in a kiln for collection later as it takes some time to dry, before it can be fired. We chose to make medium sized pots. We had an absolute blast! Aimee our instructor was knowledgeable, helpful and patient and we each took a turn to start, restart :) and complete a pot at the wheel. This also meant we were able to learn from each other’s mistakes and successes. We had around 45 minutes each at the wheel but there was no rush at all which was really nice. Complimentary refreshments were provided and once we had our finished pieces, they were dried for a while before we started painting on the glaze(s). We were all quite proud of our creations by the time we had finished – about 3 hours after we arrived. Having done just about everything we can find to do in the Cotswolds, Eastnor Pottery was, without doubt, one of the most enjoyable activities we have done. I particularly like the fact that anyone from 3 to 103 can enjoy it together, as it requires no real physical ability, just a bit of patience and enthusiasm, and in my case also a sense of humour. I really cannot wait to go back and have another go and my children and mother feel the same – fantastic fun come rain or shine and you leave with a genuine sense of achievement, having learned something new in a creative environment. 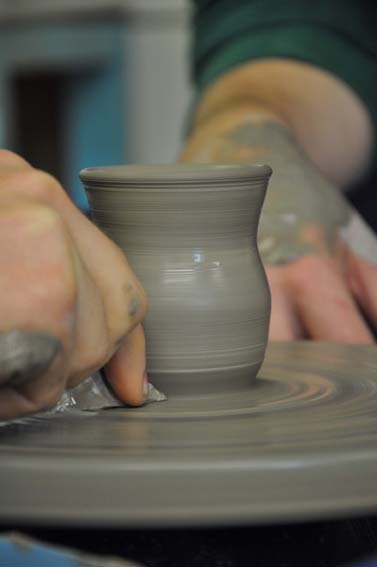 http://eastnorpottery.co.uk/wp-content/uploads/2019/03/Amazing-Pot-from-Hey-Clay-event-at-Eastnor-Pottery.jpg 567 377 admin http://eastnorpottery.co.uk/wp-content/uploads/2019/03/eastnor_pottery_header_2019-3.png admin2019-03-17 13:54:082019-03-20 00:38:24Another satisfied customer! 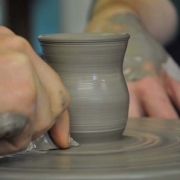 Engineers make the best potters – FACT! If our workshop participants reveal their occupation as having anything to do with engineering or problem solving then it’s a foregone conclusion they will be amazing on the potter’s wheel. We welcome engineers with open arms and have never been proved wrong. On this occasion we are reaching out to the engineering fraternity for a slightly different reason other than inviting them to come play with clay. We have x5 standing and compact ‘kick’ wheels, all the same model, made by the same manufacturer. Two of the wheel s (later editions) have design modifications and are easy to work on. The other three are slightly older and need a little bit of TLC to bring them up to speck. What our customers do when they’re not making pottery…. We wish Nicola all the best with her endeavours on and off the potter’s wheel! 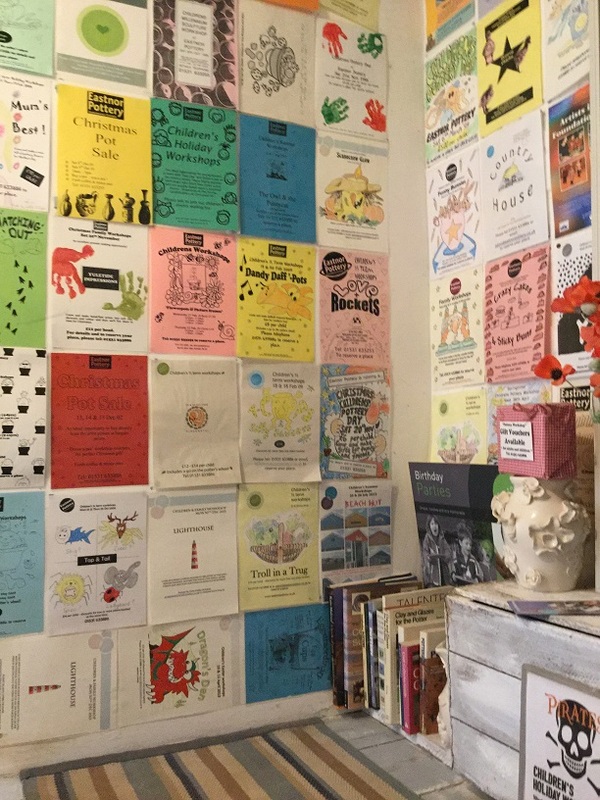 Now here’s a novel way to decorate the bathroom – posters from nearly 25 years worth of children’s pottery sessions in the school holidays. People love ‘spending a penny’ in our loo and often comment on the variety and creativity of our themed activities for youngsters. Who can forget ‘Raining Cats and Dogs’ and ‘Fish’ and ‘Dad’s a Mug’ and perhaps the most ingenious ‘Hairy Potter and the Goblets of Fire’ from way back in 2005.
http://eastnorpottery.co.uk/wp-content/uploads/2019/03/eastnor_pottery_header_2019-3.png 0 0 admin http://eastnorpottery.co.uk/wp-content/uploads/2019/03/eastnor_pottery_header_2019-3.png admin2018-10-16 15:00:372019-03-17 15:01:13Loo with a view!